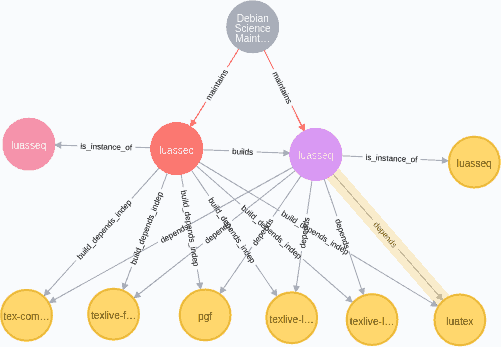 In the first part of this series of articles on analyzing Debian packages with Neo4j we gave a short introduction to Debian and the life time and structure of Debian packages. The current second part first describes the Ultimate Debian Database UDD and how to map the information presented here from the UDD into a Graph Database by developing the database scheme, that is the set of nodes and relations, together with their attributes, from the inherent properties of Debian packages. The next part will describe how to get the data from the UDD into Neo4j, give some sample queries, and discuss further work. gathers a lot of data about various aspects of Debian in the same SQL database. It allows users to easily access and combine all these data. Data currently being imported include: Packages and Sources files, from Debian and Ubuntu, Bugs from the Debian BTS, Popularity contest, History of uploads, History of migrations to testing, Lintian, Orphaned packages, Carnivore, Debtags, Ubuntu bugs (from Launchpad), Packages in NEW queue, DDTP translations. Collection all these information and obviously having been grown over time, the database exhibits a highly de-normalized structure with ample duplication of the same information. As a consequence, reading the SQL code fetching data from the UDD and presenting them in a coherent interface tends to be highly convoluted. 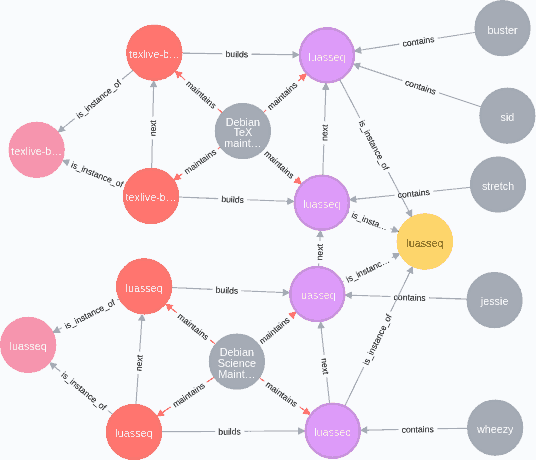 This lets us to the project of putting (parts) of the UDD into a graph database, removing all the duplication on the way and representing the connections between the entities in a natural graph way. Recall from the first column that there are source packages and binary packages in Debian, and that the same binary package can be built in different versions from different source packages. Thus we decided to have both source and binary packages as separate entities, that is nodes of the graph, and the two being connected via a binary relation builds. Considering dependencies between Debian packages we recall the fact that there are versioned and unversioned dependencies. We thus decide to have again different entities for versioned source and binary packages, and unversioned source and binary packages. where vsp stands for versioned source package, sp for (unversioned) source package, and analog for binary packages. The versioned variants carry besides the name attribute also a version attribute in the node. The relations are is_instance_of between versioned and unversioned packages, builds between versioned source and versioned binary packages, and next that defines an order on the versions. 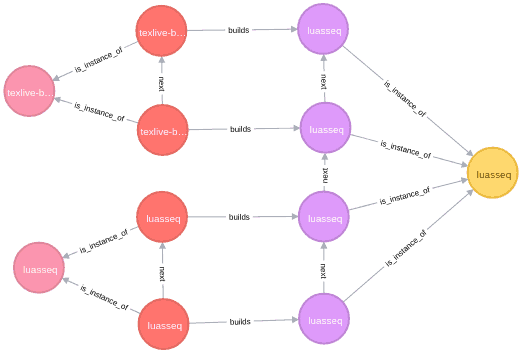 An example of a simple graph for the binary package luasseq which has was originally built from the source package luasseq but was then taken over into the TeX Live packages and built from a different source. 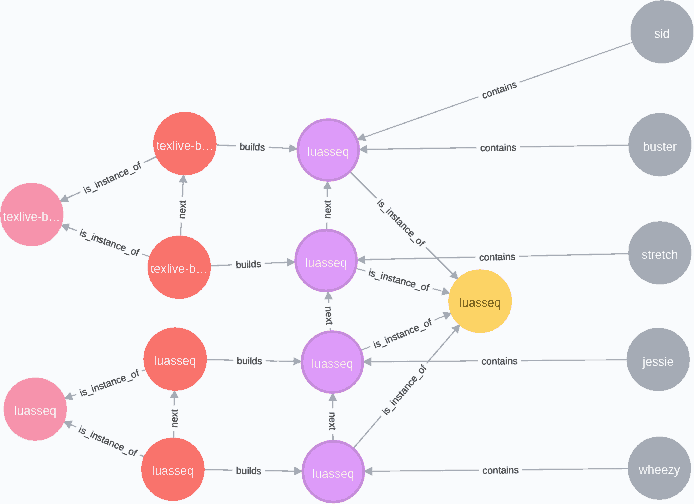 This concludes the first (easy) part with basic node types and relations. 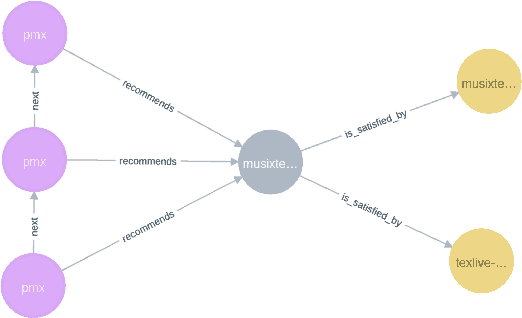 We now turn to the more complicated part to represent dependencies between packages in the graph. Our last step is dealing with alternative dependencies. Recall from the first blog that a relation between two Debian packages can have alternative targets like in Depends: musixtex (>= 1:0.98-1) | texlive-music which means that either musixtex or texlive-music needs to be installed to satisfy this dependency. We treat these kind of dependencies by introducing a new node type altdep and a new relation is_satisfied_by between altdep nodes and versioned or unversioned binary packages (vbp, bp). Now that we have the graph database schema set up, we need to pull data from the UDD and put them into the Graph database. This will be discussed in the next entry of this series.